As an employee at Mayo Clinic in Rochester, I find myself frequently scurrying through the many buildings on the downtown campus as I go about my day. One of my favorite places to walk through is the subway level of the Gonda Building, also known as the Nathan Landow Atrium. Sitting in front of a two-story high wall of windows is a beautiful grand piano that is available for anyone to play. It’s not uncommon to hear patients, visitors, volunteers and staff share their gift of music with those in the area. 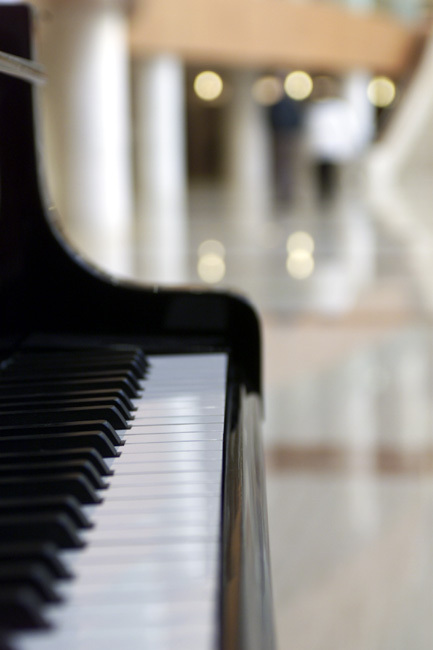 Since music is an important and enjoyable part of my life, I find myself looking forward to walking through the building and hearing people play the piano or accompany themselves while singing a favorite song. Whether the person is playing a classical piece, a popular song, a song from a musical, a jazz composition, a favorite hymn or a recital piece, I’ve been touched numerous times by the people sitting at that piano. I also look forward to hearing the “regulars”…the handful of folks who frequently play and sing for visitors. One of my favorites is Jane Belau. She’s an amazingly talented musician who plays a wide repertoire of musical pieces and songs, takes requests and not only welcomes, but invites, people to sing along. One day as I was heading back to my office from a morning of meetings, I heard “Twinkle, Twinkle, Little Star” coming from the Gonda Building. I was caught off guard as it wasn’t a song I expected to hear. As I enter the atrium area and looked over at the piano, there was Jane, playing to a darling 9-12 month old baby. The baby smiled and bounced happily in his or her dad’s arms as Jane played. The dad was smiling too. Here in all the hustle and bustle and stresses of the day was a gifted musician, one who has a handful of CDs available for purchase, not only playing a child’s song, but also singing directly to the baby as if he or she were the only person in the audience. I found myself among many others who stopped so they could watch and listen to Jane’s personal concert to this baby. It was a simple song, yet she played it with all the flourishes of a recorded piece. Not only did it bring a smile to that dad and his baby, but I saw a lot of other smiling faces in the crowd. This heartwarming sight made my day…and my week. I appreciate that Mayo seeks to find ways to integrate music and the arts in general into the medical environment by providing this piano in the Gonda Building and pianos located in other buildings. I see it as yet another way that Mayo puts the needs of the patient first. In a way, the pianos provided by Mayo become part of the healing environment. I also appreciate all the people who sit down and share their special gift of music at the pianos located across the campus. Music can offer those in the area a wonderful, relaxing diversion from the day, whether it’s a day of medical appointments, a day of waiting for a family member, time away from a hospital room or…as in my case…a day of meetings.